Three days of great education came to a close with Saturday’s Moderators’ Forum, which was moderated by Dr. Ronald Goldstein. The forum gave DPRWorld08 attendees an opportunity to ask questions on a variety of topics they came up with after listening to great educators for three days. Panelists included Drs. 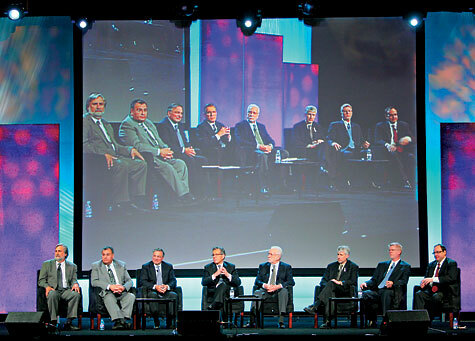 Joel Berg, Robert Genco, Alan Boghosian, John Flucke, Noah Chivian, Louis F. Rose and Fred Eichmiller, and Lee Culp, CDT. A number of attendees stood up and asked questions, while the panelists also addressed questions attendees submitted during panel sessions throughout the event. Topics included fluoride in bottled water, considerations when purchasing new technology, adhesive systems, evidenced-based dentistry, implants, laser choices, sealants, shade guides, oral systemic links and caries detection systems. Dr. Flucke, the Technology Editor for Dental Practice Report Digital Edition, offered advice for one doctor looking for the “tipping point” when buying technology.